Friday was the most interesting day of the tournament so far with a couple of shocks as eight players advanced to the second week of the 2019 Australian Open. I’m so happy it is the weekend and am looking forward to two days of getting to chill out in front of the tennis. Back to the Set Points extra post today with highlights of day 5. I read good things about the second match on MCA between Sloane Stephens and Petra Martic so decided to catch up this evening. It was a good choice. Stephens came from a break down in both sets and a mini break down in both tiebreaks to win, 7-6(6) 7-6(5) in two hours. I think of all the matches i’ve watched so far this week, Stephens-Martic featured the most most attractive tennis. There were some wonderful rallies and both players were in great form. Martic especially is delightful to watch in full flow with her aggressive groundstrokes, array of slices and willingness to come forward. It was very close and Stephens simply played the big points better in the tiebreak. I thought Stephens’s second serve was vulnerable towards the end of the match and Martic could have jumped on it more and been more aggressive. Stephens has yet to drop a set in her three matches and is into the fourth round of the Australian Open for the first time since 2014. Sloane is looking like a title contender IMO. In the most anticipated match of the day that pretty much split readers of MTB, Maria Sharapova knocked out the defending champion, Caroline Wozniacki, 6-4 4-6 6-3. Kudos to the 53% of you who went for Sharapova in the pre-match poll! Sharapova played a superb match and was just too strong and dominant for Wozniacki to handle. In the set that Wozniacki won, she hit just one winner. Sharapova did a good job at winning the longer rallies. The Russian player managed to get Wozniacki out wide, who was rarely in a comfortable position to hit on her more favoured backhand side. I thought Wozniacki was just too reactive as Sharapova upped her level to win the final three games of the match. When Sharapova’s on, it is always going to be a diffcult match-up for Wozniacki as her stellar defence and retrieval skills is rarely enough to throw her off her rhythm. Of the five Slams Sharapova has played since coming back from the drugs ban, she has reached the last 16 at three of them. This was also Sharapova’s fifth top ten win in that period. I actually think Sharapova has done reasonably well since coming back, considering all the injuries, and has been better than people make out. I guess the expectations are just so high based on what she has achieved during her career. Anisimova played a brilliant match to knock out a player that many were tipping for the title. Have I mentioned that i’m completely sold on Anisimova?! Her backhand was terrific and she can produce some wonderful angles with it. The American player maintained her court position on the baseline and was taking the ball so early, not allowing Sabalenka to dictate. In fact, it was Anisimova who was controlling proceedings which you don’t often see with the power that Sabalenka possesses. I was surprised by the one-sided scoreline but not really by the result. Despite going for Sabalenka, I had a weird feeling about this match! Joining Anisimova in the fourth round of a Slam for the first time is Collins who comfortably saw off Garcia. I wasn’t at all surprised by this result. Garcia had won her opening matches in Melbs in straight sets, but they had both been against players outside of the top 200. I think the biggest surprise for me on Friday was Anastasia Pavlyuchenkova who dropped just three games (!) against Aliaksandra Sasnovich. This is the first Slam since Wimbledon 2015 that Pavs came into unseeded. This has been her best result at a Slam since reaching the quarter-finals of the 2017 Australian Open. I don’t think this is a coincidence and I would say that going under the radar and being the underdog is a position in which Pavlyuchenkova thrives. I don’t think anyone has ever doubted her talent or ability. A pair of hugs captured by Jimmie48! I laughed at Sharapova discussing her love of croissants at 8:37 in the video below 🥐😂. A well balanced piece by Matt Zemek about Amanda Anisimova. Always enjoy reading Matt’s work which you can find at Tennis with an Accent. The schedule suits me with my four favourite matches all later in the day. Simona Halep vs. Venus Williams feels like the match of the day so i’m surprised to see it on MCA. I wonder if they got offered the second night match on RLA but opted for the first night slot on MCA instead? Karolina Pliskova vs. Camila Giorgi should be a close one and i’m eager to watch Timea Bacsinszky for the first time this week up against Garbiñe Muguruza. Madison Keys vs. Elise Mertens is on my radar. I’m also intrigued to see how Dayana Yastremska performs against her idol, Serena Williams. I’ll try and get some thoughts up on those matches on the separate page later tonight. 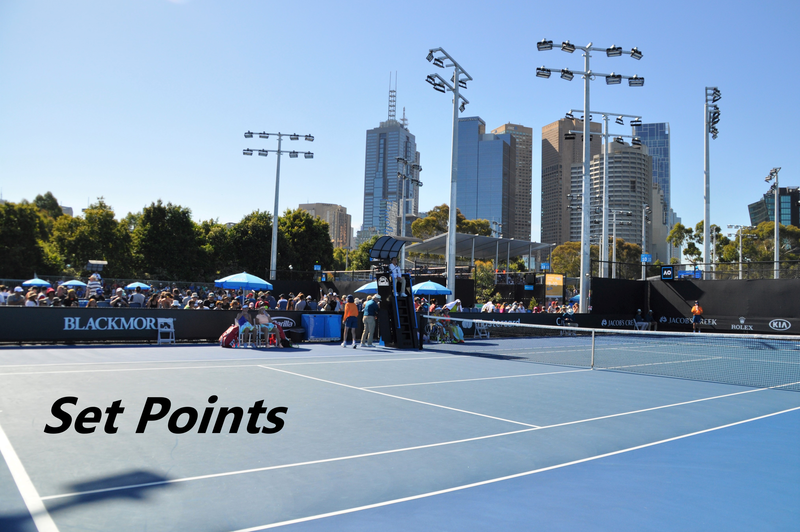 January 18, 2019 in Australian Open, Set Points, WTA. ← Thursday’s Set Points, AO 2019 Day 4: A Muguruza-Konta late night/morning thriller! Thanks for the info Andrew. I like Madi so I won’t be sorry if she wins though I agree it’s a shame if Elena’s not at her best for the match. Good win for Garbine today though like James I was hoping Timea would win. It’s just luck at the end of the day regarding the draws! I’ve been impressed by how she’s getting stronger match by match, considering the lengthy period where injuries stopped her playing. It’ll be interesting for both Serena and Halep to test where they are. I think Serena will come out super dialled in though, she will want that statement of beating the #1 as comprehensively as possible. I do hope Elina is fit for Keys. I seem to remember her being a break up in the decider of their last meeting (US Open 2017) and she tightened right up (post-Halep PTSD, I think). So she knows she *can* beat her. Yes I knew it was a tough one for Timea!